You’re in a maze of twisty little passages, all different. Planning! I clearly remember the day I realized that my next yacht should have a workshop. We were hanging out in Ponta Delgada on São Miguel, preparing for the crossing over to Ireland. Next to us was a brand new Swan 65 that was just finishing it’s first season and heading back home to the UK. It had all sorts of problems that I thought would not occur in such an expansive and high profile yacht. The heaters didn’t work. The engine had troubles with the fuel system. Some instruments had hick-ups. And so on. That’s when I realized, things breaking is part of everyday life for all long distance sailors, and that yachts should cater to that instead of trying to pretend it isn’t. By the way, we had to cancel the Ireland ambitions on that crossing, and ended up in A Coruña instead. Which was good, considering some people who failed to dodge the storm had some troubles… (That was not the same Swan, though). Anyway, today we finished the workbench, except I need to decide how to organize the walls. But that’s for later. 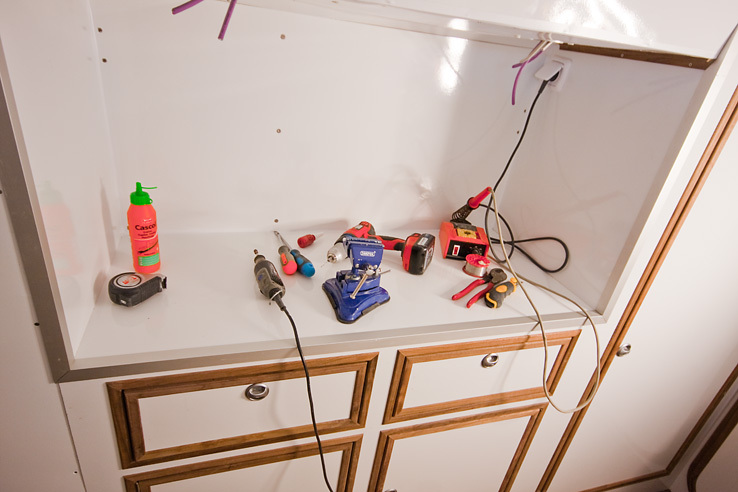 A side effect is that since the workbench is right next to the galley it can also be used for food preparation in case several people are cooking together.